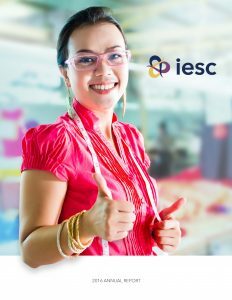 IESC has released its first formal annual report since 2009. The years separating these two reports represent a significant period of transformation for IESC. Eight years ago, times were tight, and IESC was competitive in a rather small arena. Today, there is no doubt that IESC is a stronger organization by every measure. Our total revenue was approximately $45 million, and our home office staff has nearly quadrupled. IESC has upgraded all of our internal systems and processes, built up our communications, updated our messaging, and refreshed our brand. Our 2016 annual report looks at some of the many ways IESC is expanding opportunities and improving the quality of life in communities across the world. In Afghanistan, for example, we helped to turn a sprawling, disorganized government ministry into a disciplined, accountable institution serving the nation’s largest sector. In Liberia, our dedicated field team catalyzed the expansion of small and medium enterprises, putting more than $8.5 million in loan capital into the hands of business owners, in spite of a terrifying nationwide Ebola outbreak. In the Dominican Republic, we supported women in agribusinesses to organize and learn how to tap into export markets–traditionally the domain of men–in order to bring their produce to U.S. and European buyers. As much as things have changed, IESC remains guided by a mission to reduce poverty and foster stronger, more resilient communities with private sector solutions that support small and medium enterprises around the world.